Looking for a natural lighter fluid alternative when you fire up the grill? 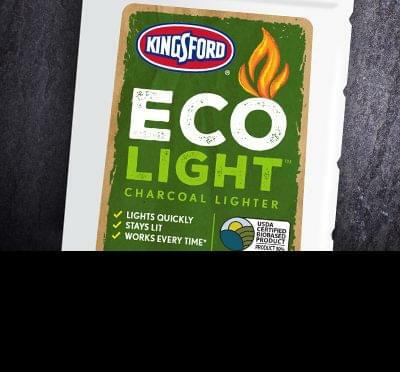 Kingsford® EcoLight Charcoal Lighter lights quickly and easily, and it's made with naturally-derived ingredients: corn and soybeans. Traditional lighter fluid is made from petroleum. It lights quickly, stays lit, and works every time. Use and dose according to lighter fluid directions. DANGER: harmful or fatal if swallowed. Combustible. Contains petroleum distillates. Do not ingest. Avoid breathing vapors. Use in a well-ventilated area. Avoid prolonged contact with skin. First aid: if swallowed—do not induce vomiting. Call a doctor or poison control center immediately. Inhalation—move person to fresh air. If irritation or breathing problems develop, call a doctor. Keep out of reach of children. Store away from direct sunlight, heat, sparks and open flames.